Mirova's international equity management activities follow a conviction-based fundamental asset management approach on European and global companies involved in sustainable development. Jens Peers started his career in 1998 as a financial advisor at KBC Bank, Brussels. He subsequently joined KBC Asset Management in 2001 as a financial analyst. In 2003, he moved to Kleinwort Benson Investors, Dublin, as head of portfolio management environmental strategies on the following thematic areas: water, agribusiness, cleantech (renewable energy, energy efficiency, waste management). Jens Peers (39) holds a master degree in applied economics from the University of Antwerp, Belgium. He is also a CFA Charterholder and is a certified CEFA (Certified European Financial Analyst of the BVFA-ABAF - Belgian Association of Financial Analysts). With the appointment of Jens Peers, Mirova underlines its ambitions in equity-thematic management. Mirova, the Responsible Investment division of Natixis Asset Management, offers a committed management approach, designed to combine value creation for investors with sustainable development. 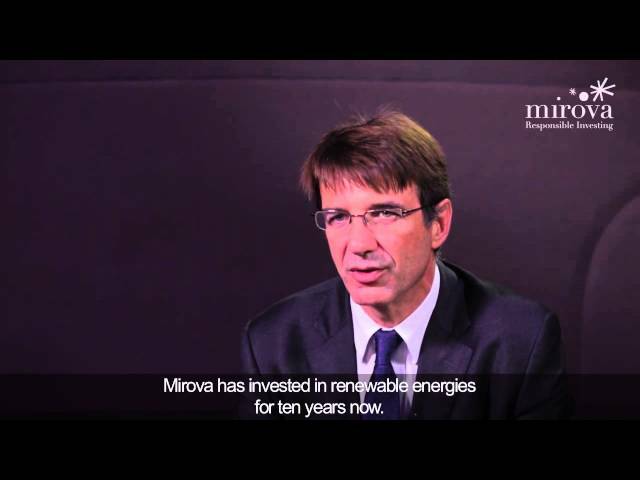 Mirova has 36 multi-disciplinary experts and develops a global approach to responsible investment with a unique offer based on 4 pillars: listed equities, infrastructure(1), impact investing(2), voting and engagement. Second-largest European manager of open-ended SRI funds and social business funds(3), Mirova has €4 billion of assets under management in SRI equity: €7.7 billion in advising on ESG (4)/ SRI (excluding equities) and €20.4 billion in voting and engagement (as of 30 september 2012). (1) The infrastructure financing business is handled by Natixis Environment & Infrastructures, a Natixis Asset Management company. (2) Impact investing: investment with strong social/environmental impact. (3) Source: Feri Lipper , based on assets under management as at 30 June 2012.